This got me thinking and I decided to follow her lead. As I was thinking about what activities I enjoy one of the first which came to mind was coloring. Yes, I like to color. My mom had three kids in four and a half years so she didn’t have a lot of time to just sit and play with us. However I do remember her coloring with me when I was perhaps 3 or 4. I’ve always loved to color and the scent of Crayola crayons is a favorite of mine. I haven’t colored anything for perhaps two years or more but a couple of months ago I printed off some adult coloring sheets. And then never got around to coloring them. Last night I decided to do one of them. David is away on a business trip and this seemed like a good time to for it. I ended up using colored markers rather than crayons but it was still a lot of fun. That’s it at the top of this post. What about you? Tell me a couple of things which you enjoy doing in the comments below. *Update: A friend on Facebook pointed out that I had left off the obvious – reading! I had put it on my Pinterest board but failed to list it here. Of course, this list isn’t complete by any means, but I couldn’t leave off reading. Being in the Caribbean – sailing, SCUBA, drinking umbrella drinks on the beach, etc. Playing music with my friends. Good list, Frank. Hopefully one of these days we will meet up in New Orleans and we can enjoy some Creole food together. Absolutely. Thanks for the inspiration. Puttering around the house, listening to my ipod. 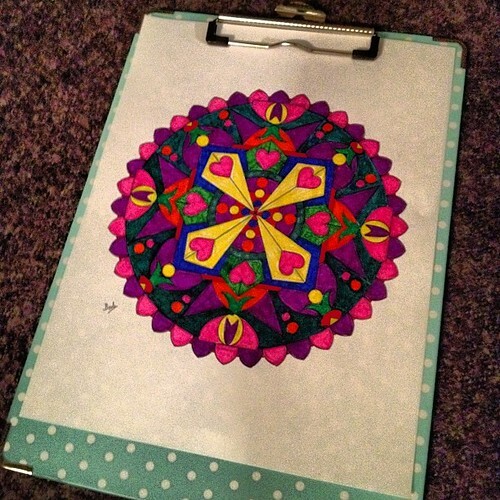 By the way, I like coloring – and doodling. I'm not a crayon or marker person; I prefer good quality colored pencils. I couldn't remember where I'd put my colored pencils the day I did this but I found them this morning. I had moved them and forget where. Ha! If THIS is being a housewife, most of us would sign-up! It is one small part of my daily life and I'm determined to make time for enjoyable activities.